About 114,000 more residents left Illinois for other states than arrived during 2017-2018. Only California and New York saw greater net out-migration. Illinois also gained about 31,000 residents from international newcomers. Between mid-year 2017 and 2018, the U.S. population grew by 0.6%, adding more than 2 million residents. America’s new arrivals—both babies and immigrants—were unequally distributed across the map. And despite moving less than in years’ past, more than 1 in 10 Americans changed their addresses, and many of them crossed state lines. Even in a single year, these dynamics resulted in sizable changes to states’ populations. The reallocation of electoral points and congressional seats that occurs following the 2020 Census count has heightened the interest in state population tallies in the final years of this decade. And labor market tightness has ratcheted up competition for luring workers across state lines and from abroad. So what’s happening at the state level regarding population change? At 2.1 percent, Nevada and Idaho led all states in population growth during July 1, 2017 to July 1, 2018, according to newly released estimates from the Census Bureau. The other swiftly growing states were Utah (1.9%), Arizona (1.7%), and Florida and Washington (1.5% apiece). While these states grew the fastest, Texas (+379,100) and Florida (+322,500) added the most people. Next in line, California—the most populous state in the U.S.—added about half as many new residents (+157,700). With a population now exceeding 39.5 million, California is home to nearly 1 in 8 Americans. Arizona (+122,800), North Carolina (+112,800), Washington (+110,200), and Georgia (+106,400) rounded out the top tier of seven states which each added 100,000 or more people. While most states saw growth, nine states lost population, including New York (-48,500), Illinois (-45,100), West Virginia (-11,200), Louisiana (-10,800), Hawaii (-3,700), Mississippi (-3,100), Alaska (-2,300), Connecticut (-1,200), and Wyoming (-1,200). But why are many states adding population while some now have more elbow room? The story varies quite a bit by state. The mix of births, deaths, and net migration from other states and abroad results in a state’s growing or shrinking population. 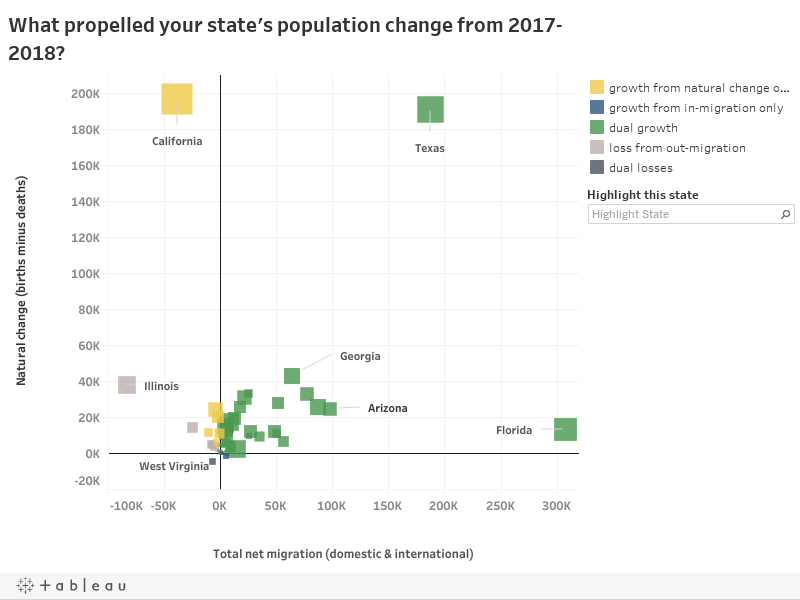 Explore the interactive dataviz below to see how natural change (births minus deaths) and net migration varied by state in the latest year of data. Note: Boxes are sized by 2018 total population, with more populous states appearing larger, regardless of the size of recent changes. Source: APM Research Lab visualization of U.S. Census Bureau’s Vintage 2018 Population Estimates. Babies or suitcases? Understanding how your state is growing (or not). 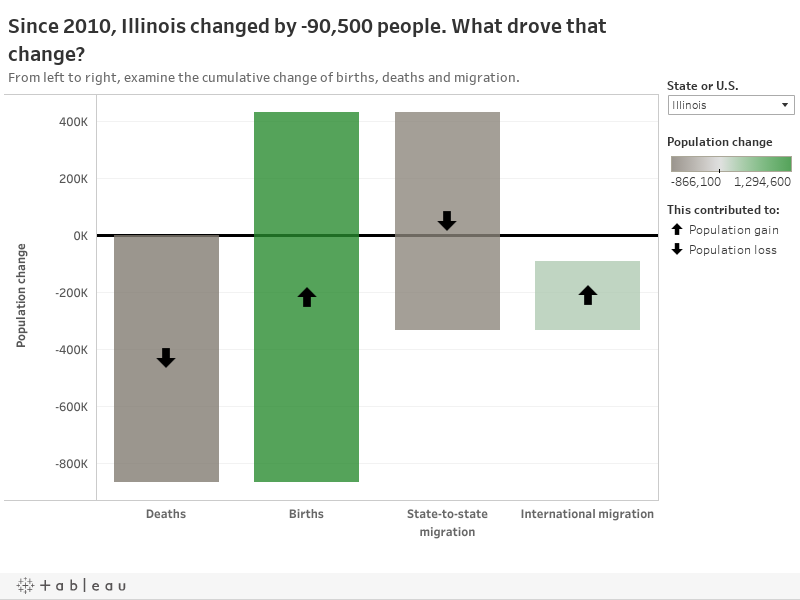 Thirty-three states and the District of Columbia grew from a combination of both natural increase (births outpacing deaths) and migration gains. Seventeen of these “dual-growth” states were powered by migration adding even more people than natural increase. Sixteen states and Washington, D.C. saw the majority of their growth resulting from births over deaths. While Florida added a nation-leading 308,300 residents from migration, it added only 13,300 from natural increase. 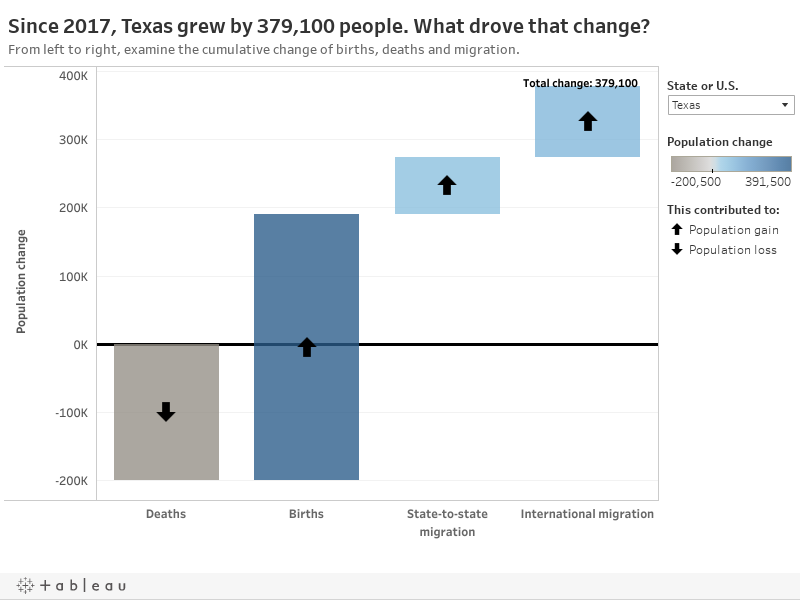 Meanwhile, Texas’ population gains came more equally from both population drivers: births over deaths added 191,000 residents, and migration contributed an additional 187,500 new arrivals. Six states that grew did so only because of natural increase offsetting losses from migration. They include California, New Jersey, Maryland, Oklahoma, New Mexico, and Kansas. Of the nine states that lost total population, eight of them had out-migration to blame, but still experienced natural increase. They include Wyoming, Connecticut, Mississippi, Alaska, Hawaii, Louisiana, Illinois, and New York. In other words, all of these states would see population gains if they could manage to attract more residents than they are losing currently. West Virginia and Maine are the only states that saw more deaths than births. (Additionally, in Vermont, the number of residents who were born and who died were nearly identical, making it likely to see natural decrease in the years to follow.) Maine is the only state that would be declining in population if not for positive net migration. West Virginia is the only state that saw deaths exceeding births and migration losses drawing its population down. You can further explore the latest components of population change for your state in the interactive dataviz below. Natural change is broken out into deaths and births, while migration is also divided into its domestic and international parts (which do not always move in the same direction). The initial view below is set to Texas, which added more residents between 2017 and 2018 than all other states. The Lone Star State grew from a combination of attracting residents from other states and abroad, as well as welcoming almost twice as many babies relative to residents who passed away. Notes: This “waterfall” graph is read left to right, with each component’s change added to all those before it. After subtracting deaths, any additional births above zero in the second bar represent "natural increase." The height of the final bar represents the total change. Select your state of interest in the upper right. Source: APM Research Lab visualization of U.S. Census Bureau’s Vintage 2018 Population Estimates. Data reflect change between July 1, 2017 and July 1, 2018. A small amount of unexplained change not attributed to any specific component also exists for some states but is not shown in the graph. If you want to see how these components have contributed to your state’s population changes over the entire decade, explore the dataviz below. The initial view is set to Illinois. At more than 90,000 net residents lost since the last Census count, Illinois led all states in population decline. (West Virginia and Connecticut are the only other states to shed residents since 2010.) As the graph shows, Illinois is still a relatively youthful state, with births far outpacing deaths. However, its net migration losses to other states—more than three-fourths of a million residents—eliminated all of its gains from natural increase and international arrivals. Notes: This “waterfall” graph is read left to right, with each component’s change added to all those before it. After subtracting deaths, any additional births above zero in the second bar represent "natural increase." The height of the final bar represents the total change after considering births, deaths, and both domestic and international migration. Select your state of interest in the upper right. Source: APM Research Lab visualization of U.S. Census Bureau’s Vintage 2018 Population Estimates. Data reflect change between the Census count on April 1, 2010 (after revisions) and July 1, 2018. A small amount of unexplained change not attributed to any specific component also exists for some states but is not shown in the graph. Reactions? Please email us your thoughts or join the conversation on Twitter or Facebook. For more trends on state-level population change see our prior series about natural change , domestic migration , and international migration . Note that these blogs use the U.S. Census Bureau’s 2017 population estimates, which have been superseded by the 2018 estimates since their publication.